PDFZilla ($30, usage-limited demo) tries to solve a common problem many people have working with PDF files: What can you do if you want to export the text to a Microsoft Word document so that you can edit it? It only partially succeeds, and depending on your needs, may not be suitable for you. PDFZilla promises to convert PDF files to Word files for editing, but it doesn't succeed in every instance. One of the biggest problems with getting text from a PDF file to Word is that if you copy and paste the text manually from PDF to Word, you'll end up with paragraph returns at the end of every line in the PDF. This means that you will have paragraph returns in the middle of sentences in your Word file. You'll then have to manually delete those paragraph returns. Although this shortcoming isn't unique to PDFZilla, it's still undesirable. I found that in many cases, and depending on the layout of the PDF, PDFZilla didn't solve the problem--paragraph returns were still in the middle of lines of text. This happens in PDFs with complex layouts, notably multi-column layouts. On the other hand, PDFZilla usually did a good job of retaining the layouts of the original PDF and including graphics. And on PDFs that did not have complex, multi-column layouts, it generally did not put paragraph returns in the middle of sentences. However, in some instances, the conversion from PDF to .doc files jumbled text together. Should you use PDFZilla? It's best to test it out on the files that you need to convert, to see whether it converts them properly. It converts PDF files to other formats than .doc, including .txt, .rtf, and others. And it will convert PDF to image formats as well. 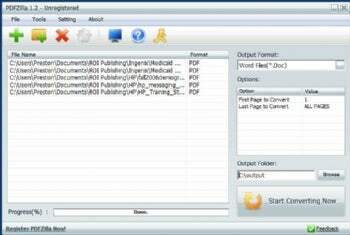 If you're looking for only PDF-to-Word conversions, a better bet is AnyBizSoft PDF to Word Converter, which does the same job as PDFZilla, but is free for personal use and is simpler to use. Business users, though, will want to stick with PDFZilla. Note: This demo version of PDFZilla will convert only 50 percent of each file unless you register it.